Lord of the Rings Online Team Snatched Up By Warner Bros. Filed to: Warner Bros.Filed to: Warner Bros.
Warner Bros. video game family grows again today, as does the its ownership of things that fall under The Lord of the Rings brand, with the acquisition of developer Turbine, maker of The Lord of the Rings Online. According to Warner's announcement, that means "all games rights for the Lord of the Rings franchise will be unified under the Warner Bros. shield," as The Lord of the Rings Online covered the "literary massively multiplayer online game" rights. That mean, whatever flavor of LotR you prefer, Warner has you covered. 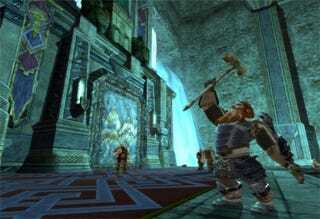 Turbine is also responsible for the Asheron's Call series and Dungeons & Dragons Online. The WB has been on a bit of a developer looting spree over the past few years, acquiring LEGO game dev TT Games, the majority of Midway's assets and talent, as well as a big piece of Batman: Arkham Asylum creators Rocksteady Studios. Warner has The Lord of the Rings: War in the North from Snowblind Studios, which it acquired last year, due in 2011, ensuring a steady stream of dwarves, elves and men, Tolkein-style for years to come.